Please join us on Friday, March 20 at 6:30 p.m. to celebrate Bikechain's 10-year anniversary and 25,000 visits! A lot of people have helped us to get this far, including our amazing volunteers, dedicated staff, board of directors, U of T unions, personnel, groups, and Toronto-based community organizations. Bikechain is a non-profit that promotes sustainable transportation by teaching participants how to diagnose mechanical issues with their bicycles and repair them independently in a DIY setting. 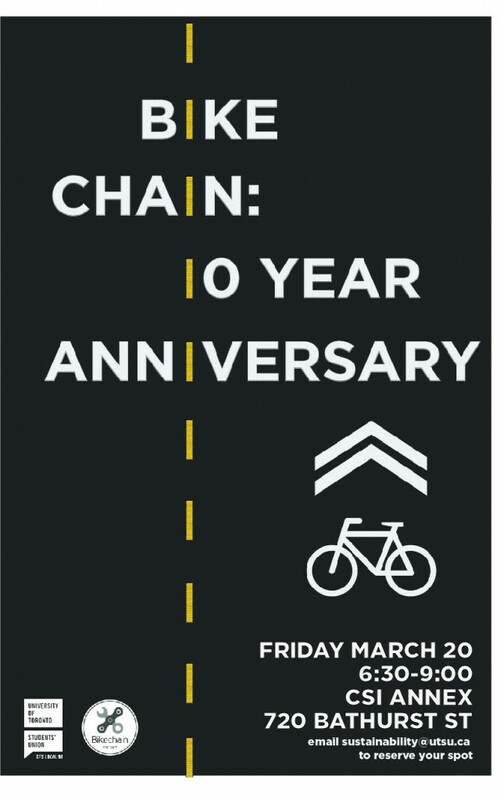 In partnership with the Sustainability Commission, this catered event will feature special presentations from cycling and urban-planning guru Yvonne Bambrick and Councilor Mike Layton. Breakout sessions and a world café networking event will follow. Be sure to email sustainability@utsu.ca to reserve your spot! Dandyhorse asks Toby Bowers and Eugene Chao: How did you learn to fix bicycles?